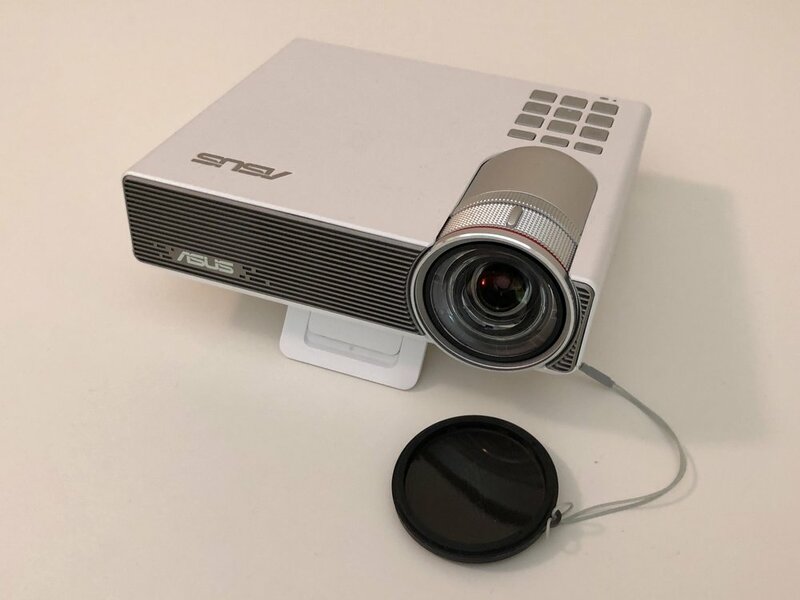 After spending more time than I care to mention researching the vast and difficult-to-decipher world of projectors — following the fantastic suggestion to maybe look into getting one from my darling girlfriend — I finally pulled the trigger on an Asus PB3. Asus' epic naming aside, I must say I'm thoroughly impressed with the surprisingly compact unit. 4. And lastly, it had to *not* be insanely expensive (as I've learnt, projectors range wildly in price from tens to many thousands of dollars). Initially, I was drawn to the so-called pocket or pico projectors because of their fantastic portability and relatively low cost, and while I still believe many of these are great options, my favourite perhaps being the Sony MP-CL1A, they all fall down when it comes to my second requirement. Bear in mine I've not personally tested any of these but they all range between 50-200 lumens, which from everything I've read leaves me to believe would produce unsatisfactory results in anything short of near-total darkness. Having ruled out these tiny options I began looking at larger units, those mostly aimed at office use, and quite frankly was unimpressed. At the lower end of the price spectrum many of these produce a picture at a resolution of just 480p and have the older 4:3 aspect ratio. 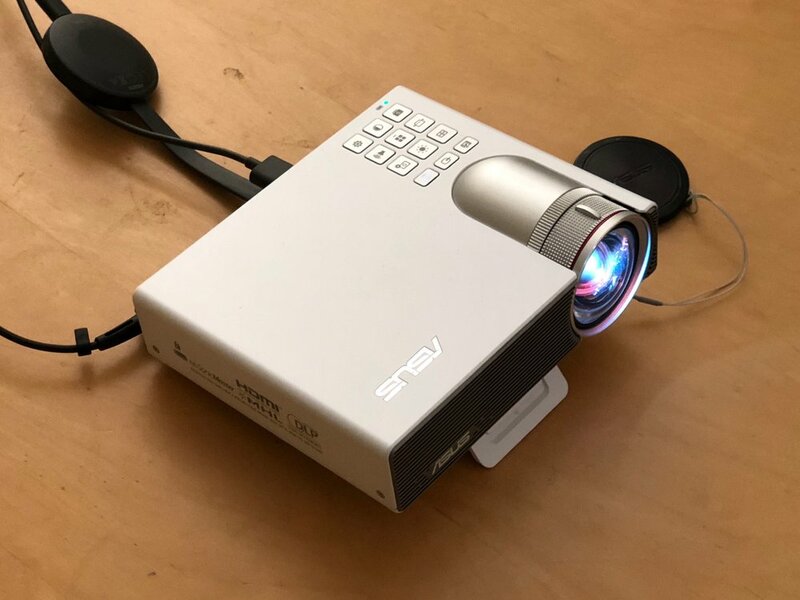 Higher resolution projectors in this space of course exist but price increases quickly and at the end of the day while they are technically portable (weighing in at around 2kg or so), they are all rather bulky and very bare bones in terms of features. Before going on with my impressions of the P3B I will just give a quick mention to BenQ's GS1, which has many of the advantages of the projector I ultimately went with but was just more expensive enough to sway me towards the Asus. One notable feature the GS1 offers over the P3B is splash resistance (when paired with its included rubber case), which could offer some good piece of mind should you be looking to host a mini movie night at the beach or by the pool. Having assessed the options I went ahead and purchased the P3B, and was immediately impressed with not only the very compact size of the unit (weighing just 750g) but also the bundled accessories. Fitting for a portable projector, Asus decided to include a nice fabric carrying case as well as a little remote control, which provides access to all settings (volume, brightness etc.) without needing to interact with the controls on the unit itself. The PB3 produces an excellent image. While it is only 720p, the picture is sharp, has a good contrast ratio (100000:1) and gets plenty bright enough (rated at 800 lumens) to be easily viewed in a moderately-lit environment where the main projection surface isn't subjected to many competing light sources (ideally indoors at night with ceiling lights off, one or two floor lamps are not a problem). One thing to note is that while on battery power (yes, the PB3 has an internal rechargeable battery) the unit is restricted to an output of 300 lumens, presumably to save power, which is still usually sufficient but not nearly as pleasant to look at in non-ideal situations. The battery is rated at 12,000mAh, which Asus states is good for up to three hours of projection, and in my experience is easily enough for at least one movie of sensible length. The P3B offers auto keystoning, and if that means nothing to you don't feeling too bad, I didn't either not all that long ago. What this essentially means is that the unit is smart enough to adjust the image it projects (in the vertical plane) to ensure that the image isn't distorted no matter how the unit is placed or the angle it makes with the projection surface. It seems this feature is fairly prevalent these days and I can understand why as without it you would need to manually adjust the image every time you set up the unit, which would certainly impact the convenience of its portable nature. Another handy feature not standard on all projectors is the PSB's built-in speakers, they are by no means home theatre quality and I do wish they could get just a smidge louder, but they get the job done and are perfectly serviceable for causal Netflix binging. On the subject of audio output I will say that for those wondering the unit doesn't run completely silently, its internal fan will spin up pretty quickly once powered on and continues to emit a fairly quiet but not unnoticeable whitenoise throughout operation (to be clear I don't find it bothersome but it is noticeable during quiet scenes). Should the built-in speakers prove insufficient the unit thankfully includes an audio out jack, meaning external speakers can be easily connected with a AUX cable. Perhaps thanks to the audible fan the P3B stays surprisingly cool, it definitely gets warm to the touch but never uncomfortably so even after extended viewing, something I was not expecting given its incredibly compact nature (and not something I could say about a great number of laptops I've owned throughout the years). The P3B retails for over AUD$1,000 and as that was more than I was willing to pay I eventually decided to bring one in from the states (via Amazon) for under $600. While I certainly prefer to support local retailers and buying internationally also leaves you more vulnerable warranty wise, at nearly twice the price it's a difficult sell. For those looking to do the same and wondering about the power situation, rest assured that Asus bundles one of their common laptop power adapters (INPUT: AC100-240V - 50-60Hz 1.5A, OUTPUT: +19V, 3.42A) — suitable for most regions around the world (although definitely do your own research) — that has a detachable mains leads with a IEC standard C5 or "Mick Mouse" connection, meaning you should be able to replace the included lead with one that works with your sockets easily and at minimal cost. As mentioned previously, being able to effortlessly get content onto the projector was an important selection criteria, and while not unique to the P3B the ability to easily connect a Chromecast made it an attractive option. Just about every half-decent projector on the market these days will have an HDMI input (which the Chromecast outputs to), however what Asus' offering has that not all do is a powered USB-A port that's capable of powering a first or second generation Chromecast. Asus also sells a WiFi dongle, which when coupled with Asus' WiFi Projection software is advertised to provide a direct wireless connection to PC or phone, but given the success of the Chromecast approach I haven't bothered to get one to test. Another handy feature is the 2GB of internal memory (not much I know but it's better than nothing), which can be used to load content on to and have it always accessible. The unit also includes a micro SD card slot that supports cards up to 32GB and provided a further option for directly playable media. All-in-all I'm thoroughly impressed with this now two-year-old gadget (having been released in 2016) and while I can't directly compare it to any other of the frankly daunting number of competing products out there, I think it's a great option that I would wholeheartedly recommend to anyone looking at getting their first projector. 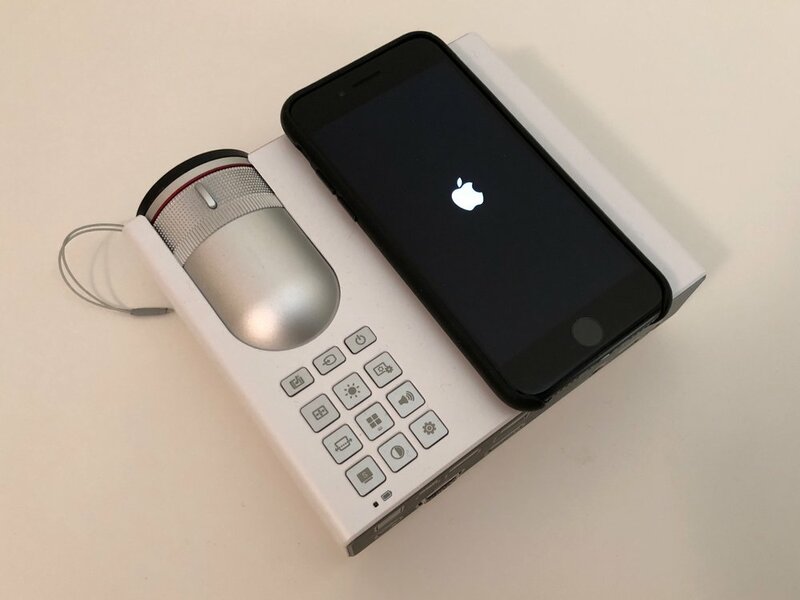 Thoughts and opinions from the mind of David Caddy: independent iOS, Android and Mac developer, IoT engineer and ever-hopeful Richmond Tigers supporter. Go Tiges!